Xe tay ga: chia 25ml đổ vào cùng dầu nhớt, 5ml đổ vào dầu láp (hộp số). Các loại máy nổ, máy nén, máy phát điện. developed by Korea NanoTech Institute. Our uniquely developed platinum coated ceramic is 20 times stronger than steel and Platinum is helpful for great combustibility & powerful engine. are moved selectively into cracked parts. Tight platinum metallic cohesion is conducted by heat and pressure. forms lubricant membrane on inner wall of engine. Smoother, Quieter Engine with more Power & economical solution. 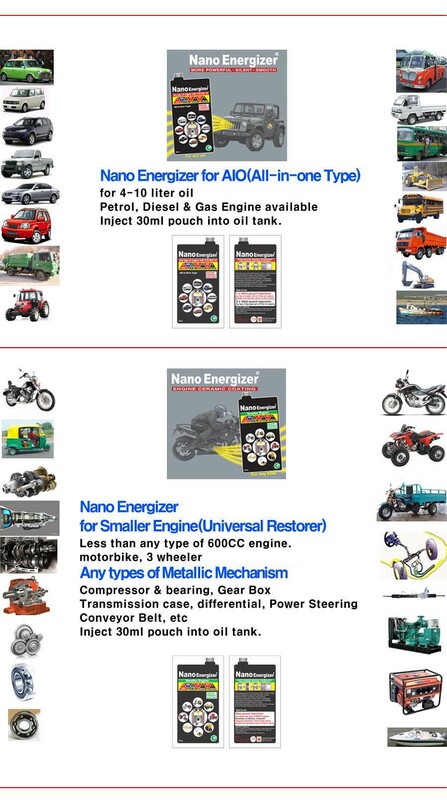 Nano Energizer recommended for automobiles at least 3,000 km of use. The effect is better for old cars. It can be used for any type of cars that uses mineral and synthetic oil. when engine oil is being changed. Recommended to change Nano Energizer upon driving 30,000km. within 1year at any running. Warm up engine after change engine oil. Shake Nano Energizer enough before injection, as subsidence may occur for long storage. Open oil filler cap and inject Nano Energizer slowly. Close oil filler cap and keep idle for 20 minutes or drive 30km. smooth, noisy drop and smoky stop & fuel saving. 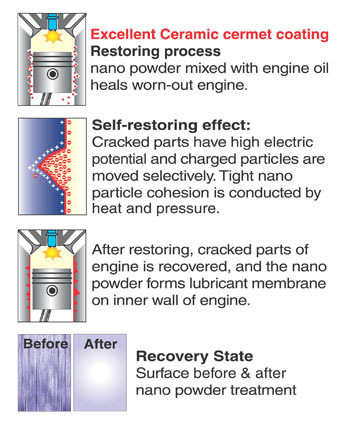 After running 1,500Km upon injection of nanoE, freely you can change engine oil. Because perfect cermet coating process within 1,500km run will be already completed on engine surface. The effect of nanoE will be continued till 30,000km to 50,000km with just one injection of nanoE AIO.